Happy New Year! You’ve almost made it through the first week of 2016, good for you! How many New Years Resolutions have you made and broken this week already? Were you one of those people that started your new gym routine on Monday and you’re already planning on sleeping in tomorrow? I know I fully plan on sleeping in! 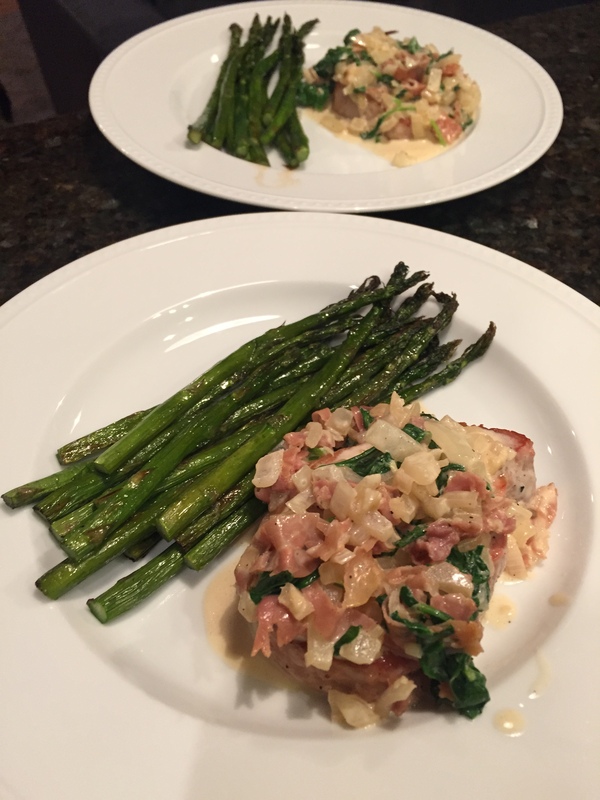 I have always been about easy cooking and 2016 is going to bring more easy and delicious recipes from Ski Boots! Life is just too short to fuss with complicated recipes and ingredients. Plus, who feels like cooking after a long day at the office? I sure don’t! That is why I am in love with my crock-pot! Put everything together, turn it on, and when you get home… dinner is basically done! I love pork tenderloin but I have not come across many original ways to cook it. 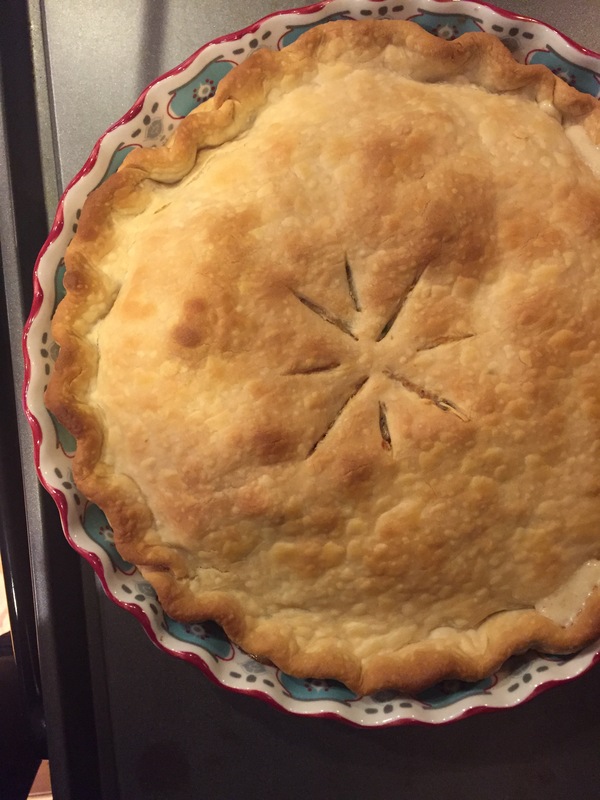 I snagged this recipe from my friend Kim’s kitchen- I can’t remember where it was from but after I tried it, I knew I wanted to make it for the blog! Happy eating! Place tenderloins in a 5-quart crock-pot. Combine 1 tablespoon soy sauce, hoisin sauce, tomato sauce, sugar, ginger and garlic and pour over pork. Cover and cook on low for 3 1/2 hours. When pork is done remove it from the pot and let stand for 10 minutes. After the pork has cooled slightly shred the pork with two forks, cover and keep warm. While pork is cooling, strain the cooking liquid through a sieve into a bowl. Return the liquid to the crock-pot and add the remaining 3 tablespoons of soy sauce, vinegar, sesame oil and chicken broth. Cover and cook on high for 10 minutes. Once the liquid has cooked for 10 minutes, turn the crock-pot off and add the shredded pork, cooked noodles, carrots, green onions, cilantro and peanuts. toss to combine. Server immediately with a lime wedge and extra cilantro for garnish. Breakfast is the most important meal of the day (or so I am told!) but I never seem to have time for it! During the week I am always running out the door in a rush, which leaves little time for scrambled eggs and bacon. 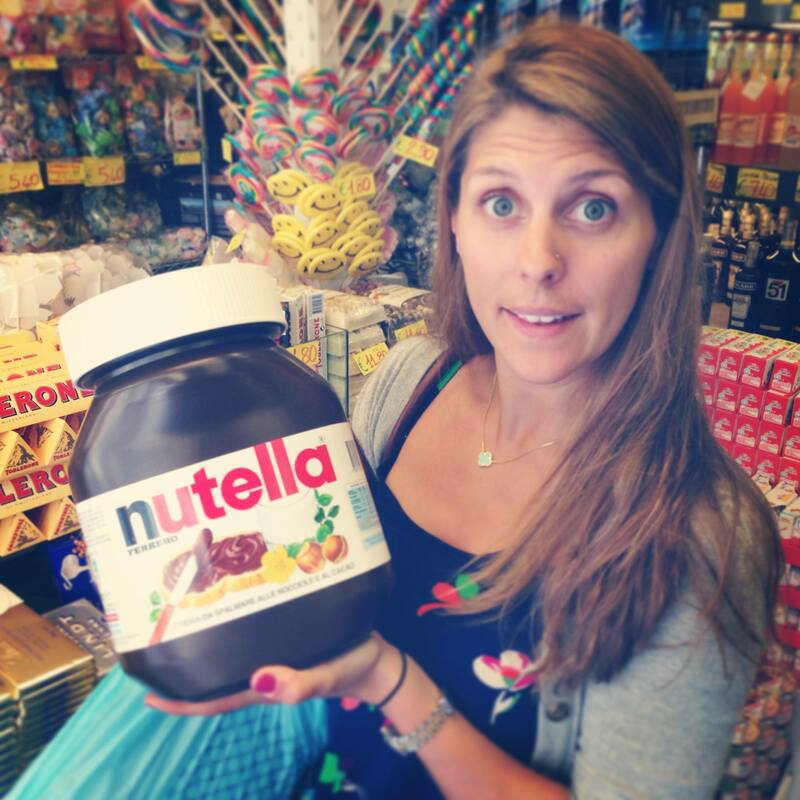 I am always thinking of easy, on-the-go ideas that I can throw in my bag and eat at my desk or in the car. 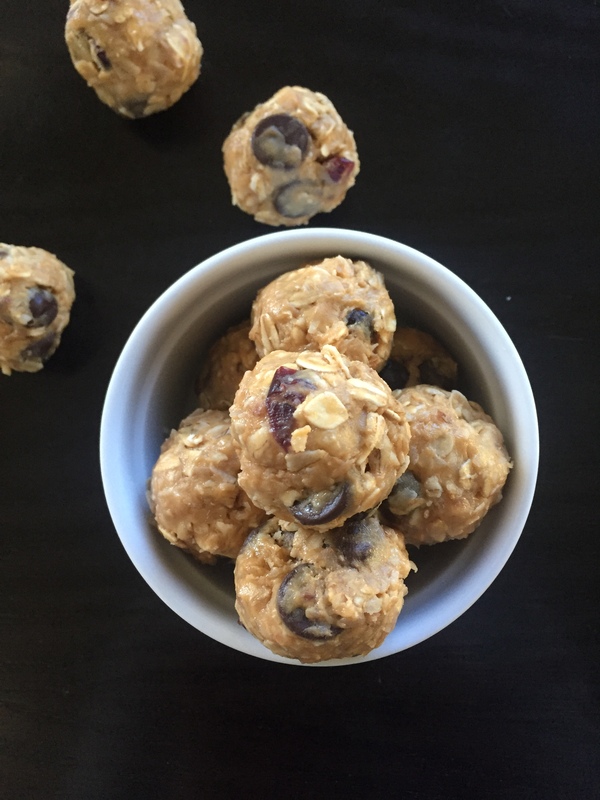 These no bake energy bites are perfect for those busy mornings. I was inspired by a local coffee shop that has similar bites when I was making these little peanut butter gems! Just two or three is enough to hold me over until I am able to blend up a smoothie or tie me over until lunch. Even better I love stuffing a few in a zip-lock bag and bringing them on the mountain with me when I am skiing or hiking! The best part about them is they taste just like a cookie… but they are healthier! Stir all ingredients together in a medium bowl until thoroughly mixed. Cover and let chill in the refrigerator for half an hour. I love a good sandwich. I came from the east coast where we take our sandwiches very seriously and you can find multiple sandwich/sub shops (Subway does not count!) within a 1/2 mile radios of Main Street. I have found that the west coast is not as fond of their sub shops as the east. It might be hard to find a good sandwich shop but it is even more difficult to find one that can make the ultimate Italian Hoagie. There is a hidden gem in Park City however, called Back Door Deli and boy can they make a sandwich! Their menu has over 50 options and I am usually a little overwhelmed by all the choices so I stick to what I know best… the Italian! A few weeks ago on a Sunday afternoon I was craving one of their delicious Italians, but alas! Back Door Deli was closed. So I decided to do a little remake on one of my favorite sandwiches at home and now I am hooked on making them in my kitchen and you will be too. Enjoy! Meanwhile, split the bread lengthwise, then pull out some of the bread from the inside. Drizzle 2 tablespoons olive oil on the bottom half. Season with salt and pepper. 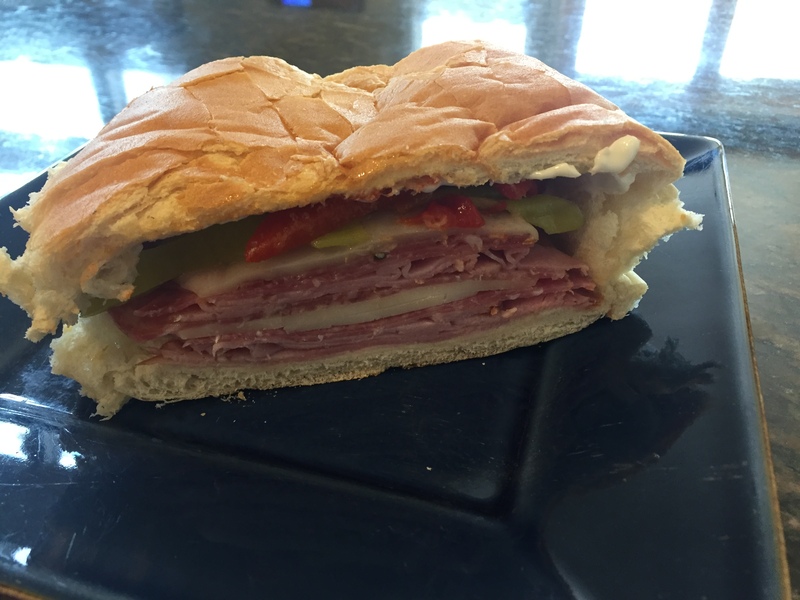 Place one layer of ham, Genoa salami, capicola and provolone on the bottom half of the bread. Repeat again with another later of meat and cheese. Drizzle the top half with 1 tablespoon of olive oil and place the sandwich open faced into the oven for 5-8 minutes until the cheese melts and the bread is toasted. Remove from the oven and cut into 4 pieces. Happy Friday! It’s almost that time of year again… The holidays! They are just around the corner and you know what that means, endless treats, baked goods, cookie swaps…. I can feel my pants getting tighter as we speak! It is so easy to fall into bad habits this time of year. The weather is colder and you know it will be at least 6 months before anyone is going to see you in your bathing suit. Let’s get a jump start on those New Years resolutions and stay healthy through the holidays this year! 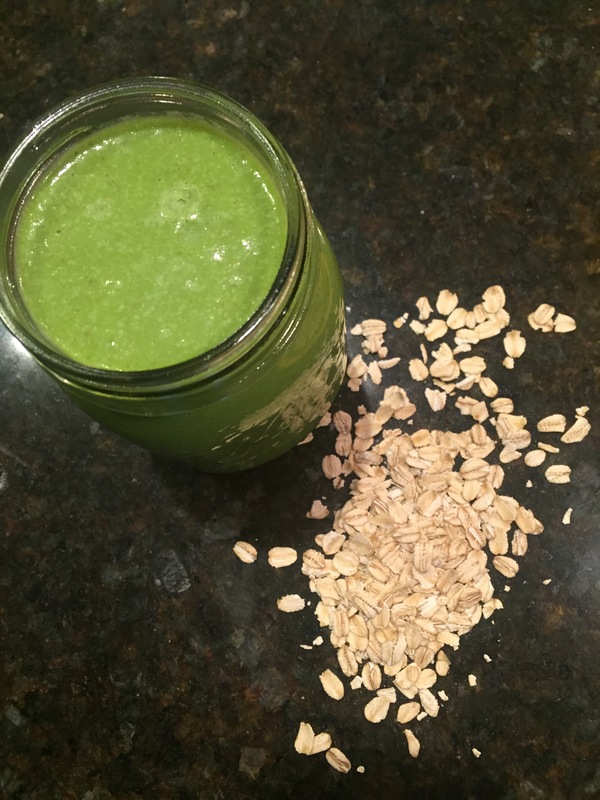 I love this smoothie for my pre or post workout meal. The oatmeal helps make the shake more substantial, plus the spinach adds to your daily intake of iron, vitamin C, fiber… all the good stuff! I like to blend this smoothie up at night before bed, put it in a mason jar for the AM. Just shake it up and enjoy the next day! There is no better way to start your day then with a healthy meal to boost your metabolism. 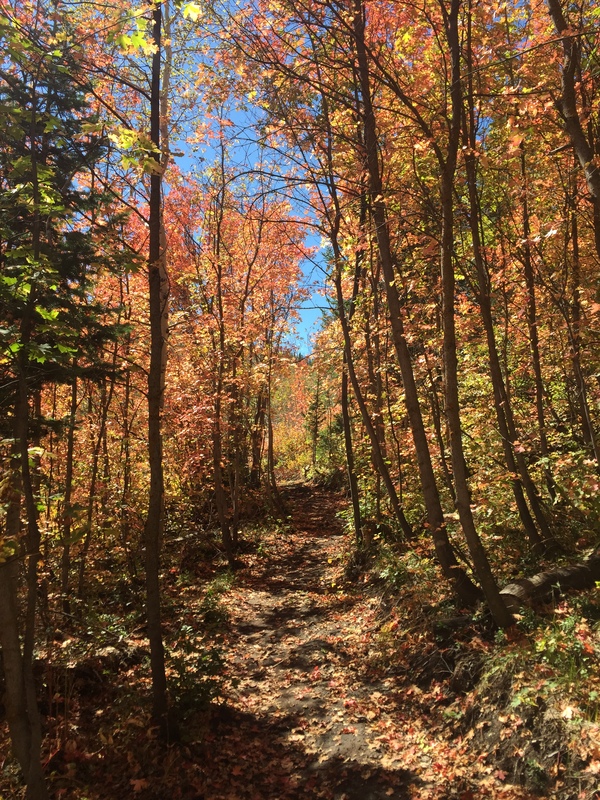 Can you believe that it is the last week of October? Each week and month seems to go by faster than the next. Before you know it we will be celebrating the New Year and it will take me 2 months to get used to writing 2016 instead of 2015 on everything! Ok but I am getting ahead of myself! 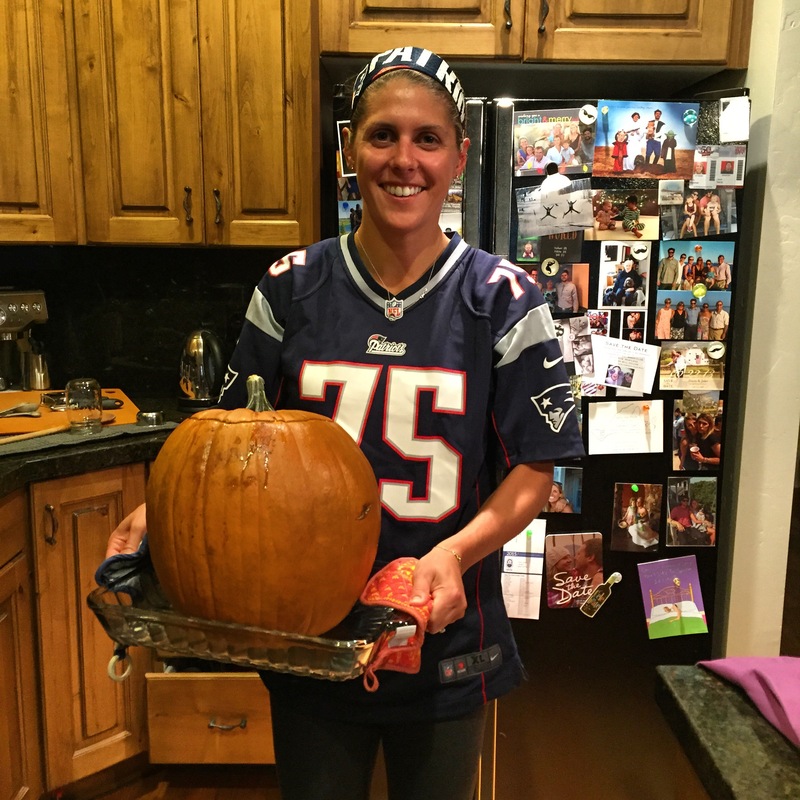 The fall weather has been gorgeous and I have been cooking all of my favorite fall recipes including Stew in a Pumpkin, which was the first recipe I posted on Ski Boots in the Kitchen three years ago last week! It’s hard to imagine it has been three years! It has been so much fun cooking and writing recipes and even more fun when I hear that you’ve been cooking my recipes. 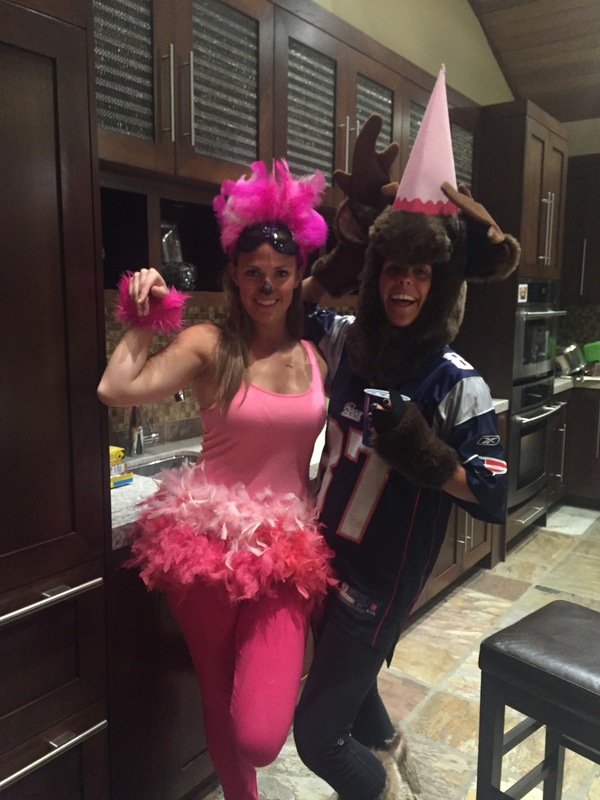 This year I am doing Thanksgiving dinner at our new house in Park City and I have already started to think about what I am going to make, stay tuned in the coming weeks for some fun Thanksgiving recipe ideas. I came across this recipe for Butternut Squash and sausage stuffed shells and it sounded so good I had to try it. It was a delicious balance of fall flavors, spicy sausage, and creamy cheese. Enjoy! Preheat oven to 400 degrees. Arrange onion and butternut squash in an even layer on a lined baking sheet. Drizzle with olive oil and season with salt & pepper. Roast for 50-60 minutes. Meanwhile, cook sausage over medium heat. When sausage is mostly browned, add spinach and garlic. Cook until spinach is wilted and remove from heat. Place roasted butternut squash and onion in a food processor or blender. Pulse until a smooth puree forms. Blend in milk and vegetable broth. Pour half of the butternut squash sauce into base of a 9×13 baking dish. In a large mixing bowl, stir together ricotta, parmesan, mozzarella and egg. Add sausage and spinach into ricotta and stir until evenly distributed. 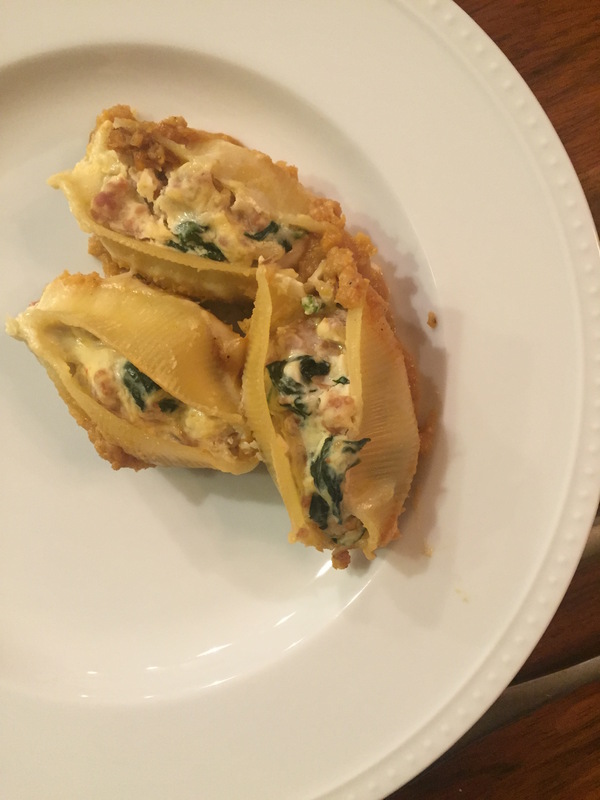 Fill cooked pasta shells with 3-4 tablespoons of filling. Arrange shells in butternut squash sauce in the 9×13 baking dish. Pour the rest of the butternut squash sauce over the top and bake for 30 minutes covered with aluminum foil followed by 15 minutes uncovered. Top with additional parmesan. I keep waiting for it to feel like fall but the warm weather will not quit! It has been beautiful the last week with bluebird and sunny skies and temps into the mid 70’s. I finally purchased a few pumpkins at the grocery store because I felt like even if the weather was not going to act like fall, I was going to make it look like fall. 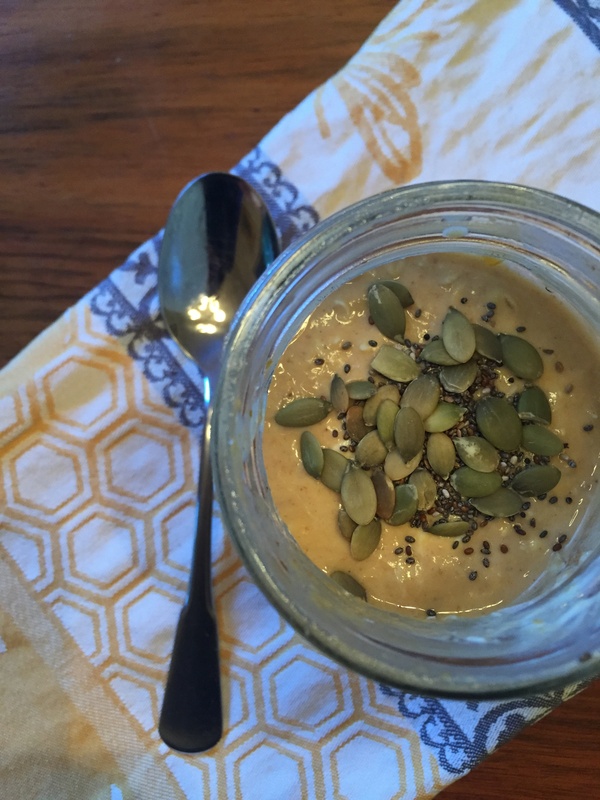 I have not indulge in a pumpkin spice latte or apple cider yet either, but have been feeling like I need something festive so when I saw this recipe for Pumpkin Pie Overnight Oats I decided it would be the perfect recipe to get me in the fall spirit. One of my favorite overnight oat recipes is my Chunky Monkey Overnight Oats– I know a lot of you love this recipe. It is such an easy and delicious recipe and great for those mornings when you don’t have time for breakfast. 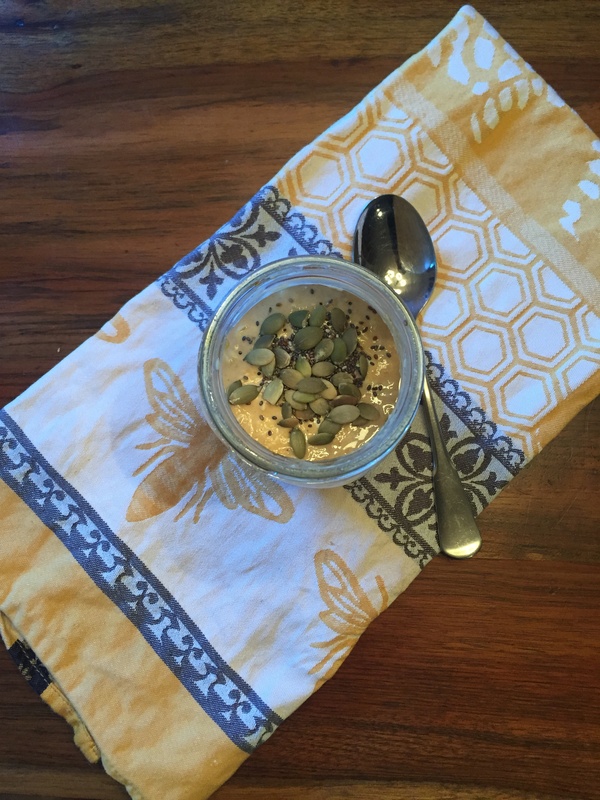 I love making my overnight oats in a mason jar and throwing it in my bag to eat at my desk. This recipe is not too sweet but feel free to add some extra maple syrup if you need to. It would also be delicious with chocolate chips or some graham cracker crumbles over the top for some added crunch. Now that you’re eating pumpkin pie oats you can save that $5 you would have spent at Starbucks and buy a glass of wine after work instead! I know… brilliant, right?! Enjoy! Combine all ingredients in a bowl except for the pumpkin seeds. Stir everything together, cover, and let sit in the fridge overnight. That’s it! Take the mixture out of the fridge, stir and sprinkle with pumpkin seeds. Drizzle with extra maple syrup if it is not sweet enough for you. Enjoy! Combine bourbon, vermouth, maple syrup and bitters is a cocktail shaker filled with ice. Shake several times, strain into a chilled martini glass. It’s been a rainy few days in Park City and I have been craving some comfort food. I have also been looking for any excuse to turn on my stove! It has been so cold but I am refusing to turn on the heat yet… it’s too early! A few weeks ago I went over to a friends house and she made me this dish from one of her favorite cook books, Gluten-Free Girl Every Day. After one bite I asked her for the recipe! 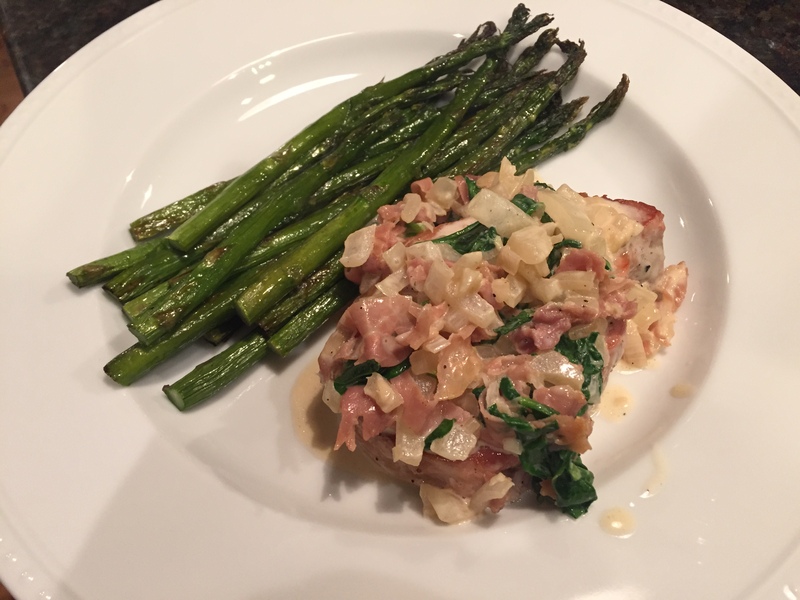 It was so delicious with the combination of the salty prosciutto and the sweet onions and cream. It tasted like a dish you would order in a restaurant yet it only took 30 minutes to make and about 8 ingredients! It didn’t take me long after getting the recipe to make it again and I was just as pleased the second time around. Plus it’s gluten free and I love finding some delish GF recipes for when we have guests with dietary restrictions over. Give this recipe a whirl… you won’t be disappointed! Enjoy! Season pork chops with salt and pepper on both sides. Heat oil in a large skillet over medium-high heat. Place chops in the pan and let them cook until one side is brown, about 5 minutes. Flip the chops and put the pan in the oven. Cook until they reach an internal temp of 145F degrees (about another 5-7 minutes). Take them out of the oven and put them on a plate to rest. Put the same skillet back on medium-high heat. Add prosciutto and cook stirring occasionally, until it is crisp (about 5 minutes). Remove from the pan and set aside. Add the onion and garlic and cook until the onion is translucent – about 6-7 minutes. Stir in rosemary and cook 1 minute longer. Pour in cream and bring to a simmer. When cream begins to simmer add chopped spinach and stir. Add prosciutto back into the sauce and stir to combine. Season to taste with salt and pepper. Plate the pork chops and spoon all the spinach cream sauce over the top of the 4 pork chops. Welcome to Ski Boots in the Kitchen, I'm Perry! You can find my cooking and life adventures at high altitude here. I love food, wine & the mountains, I hope you'll join me in my adventures! Enter your email address to follow Ski Boots in the Kitchen and receive notifications of new posts by email.